Rainbow Spaghetti Wall; a Fine Motor Adventure. 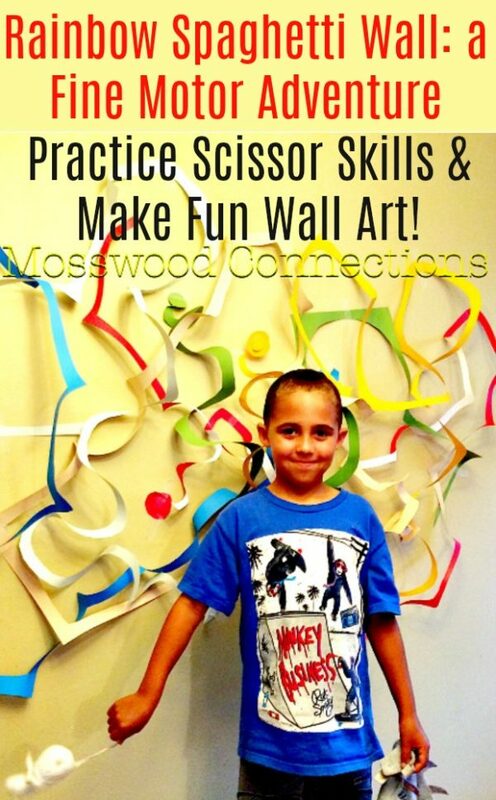 Practice Scissor Skills and Make Fun Wall Art! A few weeks ago I looked at the calendar and realized that school was only a fortnight away and although L has kept up with his reading and math, we hadn’t spent a whole lot of time working on scissor skills and fine motor skills. Summer as I see it is a time to be outdoors mastering the art of climbing trees and crossing creek beds while also expanding gross motor coordination and core strength. However, with school right around the corner, I decided that it was time to start incorporating some activities that would reinforce his fine motor skills and there’s no better way to do this than through arts and crafts. Targeting Scissor Skills with Craft Projects. Craft supplies are plentiful in our home and while sometimes we come up with complicated projects that require specific materials, other times the projects are simple, such as this one. L is a talented little artist but all artists have tools they have not yet mastered. His area of need happens to be cutting with a pair of scissors. His cutting is haphazard and is often jagged and messy. Once I targeted the skill I wanted to work on I came up with this project. 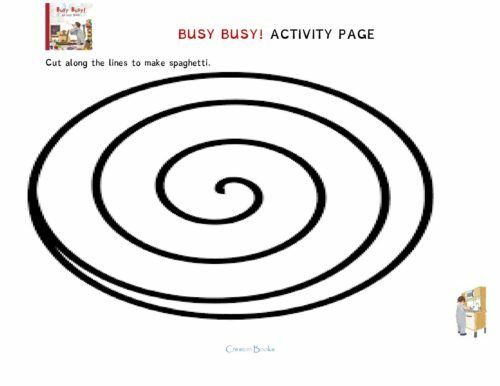 Work on bilateral coordination as well as spatial awareness. Starting on the corner of a sheet of construction paper, I drew a nautilus all the way to the center of the page. His job was simply to follow the line with the scissors. The end result was a long curl of colored construction paper. This is where the project was supposed to start and end but as always the project took a life of its’ own and before I knew it, it became a 3D art installation on our dining room wall. L decided to cut several sheets of construction paper into the long curls and then he taped them to the wall sometimes weaving them under and over each other. Visually it was very appealing, and it is the first three-dimensional piece he’s created on our wall. 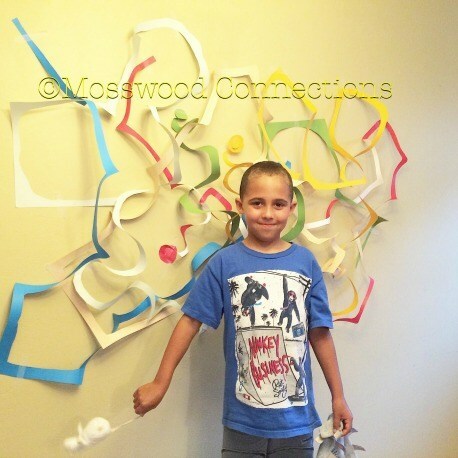 Aside from making beautiful artwork and improving his cutting skills, this activity resulted in a great opportunity to work on bilateral coordination as well as spatial awareness. It’s always exciting to me when I see L acquiring skills in a fun and meaningful way.